Silvia Fernandez Lopez first appeared on the competition circuit at Brush Wars 2017. She appeared in the Professional Bodypainting category, but wasn’t yet a pro and returned the following year in the Student category. 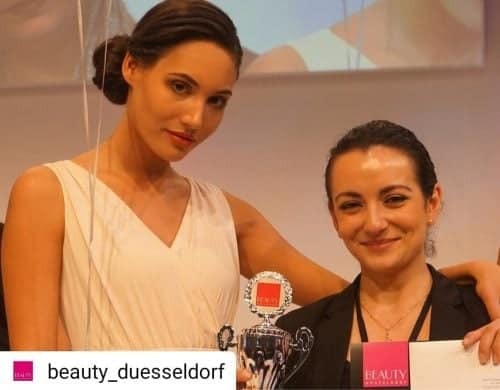 Here, Silvia won first place in Brush Wars 2018 and as part of this title won the opportunity to attend Beauty Düsseldorf and compete in their make up competition! Last week, Silvia won third place in their competition and so, after what has been an incredible six months, we thought it was time we caught up with Silvia and found out more about her journey so far. Congratulations on your win in Düsseldorf! It must have been an incredible experience – how did the competition go for you and did you think you’d be walking away with a trophy? The competition was very nice, all of the organisation treated me very kindly and they created a nice atmosphere for all the contestants so we really didn’t feel we were competing. The level of skill was very high as most of them came from a beauty make up competition and I was coming from a body painting competition so I honestly didn’t expect to win anything. When they said my name I was in shock – I just couldn’t believe it!! You won first place in our Student Category at Brush Wars 2018, so it’s been an incredible six months for you! What was that experience like and what made you enter Brush Wars 2018 in the first place? I entered Brush Wars because I honestly wanted to probe myself. I was good at body painting and, after an incredible body painting course, I felt I was ready to enter in the competition again. The first time I entered I didn’t have much knowledge and I thought I was a pro 😅 (but I didn’t have a professional body painting background, just personal projects) so after listening to some tips from the judges at the competition about getting a proper course, I came back as student. I was very surprised as some of the girls came from the same course as me, so the winner could have been any of us! What advice would you give to those make up and body paint artists who are wondering whether they’re ready and/or capable to compete at Brush Wars 2019? To those who are not sure if they are ready or not to compete I would say go, definitely go and try. Even if you don’t win, you’ll get contacts from people in the industry, painters, photographers, models and you’ll learn a lot from other artists. Also you’ll get the experience to keep going on and make the best of future competitions. How has winning in both Brush Wars and Düsseldorf affected your career? Winning Brush wars has definitely given a huge push up to my career. What’s next for you in the coming year? I have a lot projects coming up in Tv and theatre, also a huge personal body painting project that hopefully get published on the news as its very ambitious but definitely it doesn’t stop my feelings about competitions and I’m getting ready for next Brush Wars, these time as Pro 🤗. To register for your place in Brush Wars click here.